We’d love your help. Let us know what’s wrong with this preview of 風之谷 6 by Hayao Miyazaki. To ask other readers questions about 風之谷 6, please sign up. Only one volume left :( Lots of major plot developments in this one, and some shocking violence! Great wrapping up of Nausicaa's story. Get to see continued character growth from her as well as the many characters whose lives she touches. ... have not much to say about these beautiful little pictures. They look great printed in sepia at a bigger size than that used in Viz's Perfect Collection edition. I also appreciate this edition's decision not to translate the sound effects within the art itself, preserving Miyazaki's dynamic lettering. After reading this episode, Nausicaa has vaulted to near the top of my list of favourite reincarnations of MLK, Jr ...... Jesus is still #1. The spores are inside you. It would be easier to compensate for them rather than eradicate them. Isn't that the suffering of human nature though? The only truly pure thing is dead to us. Tuulen laakson Nausicaän kuudes osaa sisältää edellisiin verrattuna vähemmän sotaa ja poliittista kähmintää ja enemmän prinsessa Nausicaän seikkailuja "pahan" luonnon ja omien "uniensa" keskellä. Tässä osassa on myös yksi koko sarjan hienoimmista kohtauksista kun Nausicaä raahaa häntä jahdanneen Dorukien keisarin keskelle metsää. Dorukien keisari on enää vain kaikkea pelkäävä raunio, mutta Nausicaä yrittää kaikesta huolimatta pelastaa tämän pimeydeltä. Rytmitykseltään tämä osa on edellisiä hieman Tuulen laakson Nausicaän kuudes osaa sisältää edellisiin verrattuna vähemmän sotaa ja poliittista kähmintää ja enemmän prinsessa Nausicaän seikkailuja "pahan" luonnon ja omien "uniensa" keskellä. Overall, I’ve been pretty pleased reading these graphic novels so far. The author still surprises me every once in a while which is refreshing. A beautiful depiction of the best and worst sides of humanity and human nature. A beautiful, melancholy, action-packed breather volume. We also experience some absolutely breathtaking imagery and philosophy. Love love love Nausicaa and anything Miyazaki. Art is lovely, plot is multi layered and intriguing. I am looking forward to volume 7! I started reading this series with the assumption that I might read one a week, interspersed with other graphic novels, and it would be a pleasure to revisit a comic which has been a big influence on me and finally read it from beginning to end. I actually half-expected to not find it as mind-opening as I did the first time I read it, or the bits of it I was able to collect, in fact I assumed it wouldn't be - there's been a lot of ink under the bridge since the days of Ummagumma Comics in the pr I started reading this series with the assumption that I might read one a week, interspersed with other graphic novels, and it would be a pleasure to revisit a comic which has been a big influence on me and finally read it from beginning to end. I actually half-expected to not find it as mind-opening as I did the first time I read it, or the bits of it I was able to collect, in fact I assumed it wouldn't be - there's been a lot of ink under the bridge since the days of Ummagumma Comics in the printer's shop on Father Matthew Street in Cork. But here I am, rushing through it. Well, not even rushing, savouring it, admiring the craft and the imagery and more-pertinent-than-ever themes of ecological devastation and the survival of humanity, but definitely suspending all other activities to keep reading it through to the end. Nausicaa is lost inside herself, under attack from the dark spirit of the Emperor's brother while the Emperor himself has captured Kushana and extorted a marriage agreement from her, while he prepares to deploy the recovered God Warrior, one of the things responsible for the Seven Days Of Fire that destroyed civilisation hundreds of years before. The Sea Of Corruption might be part of the great flow of life, but it is Nausicaa and her love for those that are alive now that can keep humanity from annihilation. 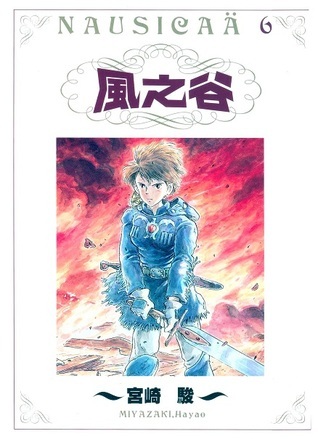 Nausicaä faces a spiritual journey in the penultimate volume of the series and in the process is able to heal the black soul of the Dorok emperor's brother and set him free. She also discovers a secret of the Sea of Corruption but when she returns to the land of the living, while trying to protect the people she loves, she accidentally awakens the last remaining God Warrior in the world - one of the genetically engineered giant super-warriors who destroyed civilisation in the Seven Days of Fire, Nausicaä faces a spiritual journey in the penultimate volume of the series and in the process is able to heal the black soul of the Dorok emperor's brother and set him free. She also discovers a secret of the Sea of Corruption but when she returns to the land of the living, while trying to protect the people she loves, she accidentally awakens the last remaining God Warrior in the world - one of the genetically engineered giant super-warriors who destroyed civilisation in the Seven Days of Fire, a millennium earlier. It was a little serendipitous that I found this series. I was reading another manga and saw an ad for this in the back of the book, then the next day saw these at the library. This story has beautiful art and a deep engaging story. Now, I can watch the movie. As an aside, I'm unsure how they could possibly condense this series into one movie, but I'm sure it'll be great since it's Mayazaki. via NYPL - Six (of seven) volumes into this thing, I should have a better idea who some of the players are and why certain things are happening. But the art's striking (though often impossible to follow) and the main cast is compelling. Some interesting things happened in this volume, but not enough to make it a good read. It was pretty boring overall, too many battle scenes, and the best part about it is that I only have one more left to read! Quizás es que con los dos últimos me he auto-generado unas expectativas y como no se han cumplido me ha decepcionado un poco. El final, quiero decir las dos últimas páginas, no ha sido para nada lo que yo esperaba, aunque no está mal. Pero el final (como parte) ha sido bastante épica. I highly recommend this to anyone who wants to read about a strong female lead who saves the world. This is an amazing tale which moved me to tears. This is really a good volume, so many feels! Nausicaa is one of the best female lead I've seen so far. Can't believe there is only one volume left, such an amazing series. Stunning, beautiful and haunting. Nausicaa's struggle in bringing the peoples of the earth into harmony continues into another realm. Le chef d’œuvre de Miyazaki, où l'on trouve déjà tous les thèmes chers au Maître. This series is slow to pick up the pace, but stick with it until the 3rd or 4th book and you'll be amazed at how much more depth & addicting storyline the books have than the movie. There is so much more to Nausicaä's story in these books that it makes the film look like a mere shadow.